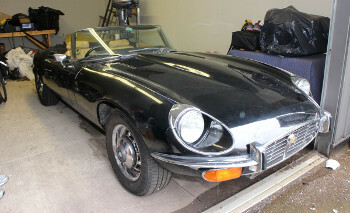 We discovered that mechanically it was in good shape, body wise it had had front nose damage that had been poorly repaired. The paint on the hood had a line in it where they had blown it in, they didn’t even bother to paint the whole hood. The panels in front of the radiator were missing. I arranged to buy the car for $3,500, the mechanic did about $500 of work and I drove it to New York City and back on vacation. Just after I bought the car and I was driving it downtown Toronto, someone approached me on the street to ask me if I wanted to buy their recently wrecked car. I think I paid $500 for it and I placed it with my mechanic and we split the income from selling parts and he took the engine for a project he was working on. The car turned out to be very reliable. 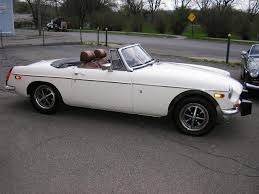 It had one regular problem, every year when I took it out of storage, I would get it to the top of the driveway and it would quit, the fuel pump needed attention. I was told to use a hammer and hit the fuel pump a couple of times to wake it up, it always worked. A remarkable aspect of the car was that it still had two six volt batteries, it had never been converted to one twelve volt unit. I think I had those batteries for most of the 15yrs I had the car. Eventually, reluctantly, I converted to a Honda Civic twelve volt which just fitted into the space of one six volt holder. In the years I had the car I did three major updates. I was at an MG club meet when I had a chance to buy two used leather seat covers, which I did. I gave them to John Kokal, interior trim artist, to install, plus Wilton carpeting. Rebuilding the driver’s seat was one of the best improvements I ever made along with changing the gear box to overdrive. A Stayfast convertible roof was next. I drove it uneventfully for years. One thing I noticed was that on the highway, because it was white and relatively low, trucks tended to not see me in their right side mirrors. My son drove the car away when leaving his wedding. 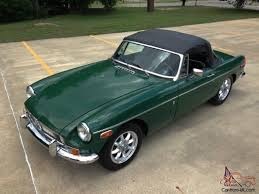 Towards the end of my period of owning it, I had a chance to have the body redone and the colour changed to BRG (British Racing Green) at the local body shop school. They did a great job and it transformed the car. After the colour change many more people asked me about it than they had before. After 15yrs, I got bored. I even bought a license plate, 2B NOT2B, because I couldn’t make up my mind about keeping the car. 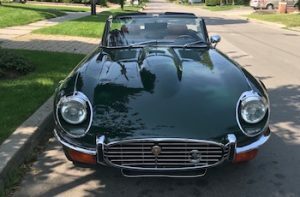 I sold it for good money to a nice home, I then bought a four seat convertible, a 328Ci BMW, my logic was this way I could get my two grandchildren in the back. If they have been in the car 12 times in twelve years, I’d be surprised. This car is a very clean unit originally delivered in the U.K. More information on the listing page. UPDATE: May 2014, this vehicle is now sold. 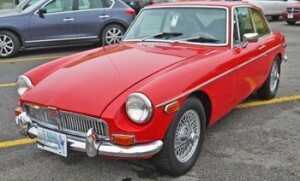 More information and pictures on the listing page for this ’74 MG B GT Coupe! 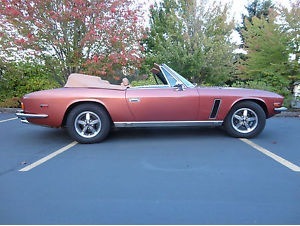 Metallic Rosewood 1974 Jensen Interceptor III Convertible For Sale. Jensen’s most prestigious and powerful achievement. (Note: This is not a Bramhall Classic Autos listing.) Older repaint shows some chips, small rust bubbles on hood around hinges. 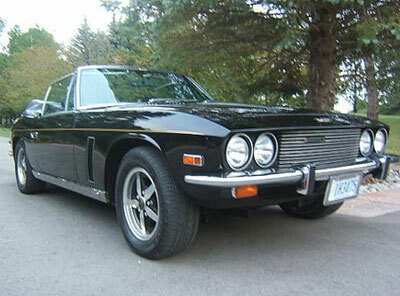 Take a peek at our list of Jensen Interceptors For Sale! 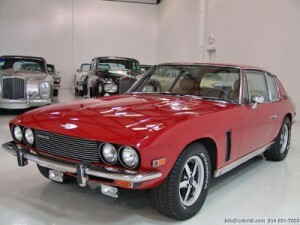 Rare left-hand drive 1974 Jensen Interceptor III For Sale. Solid California car — lots of pics! Gotta have a look at this one. 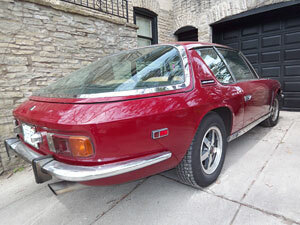 UPDATE: This classic vehicle is now sold. 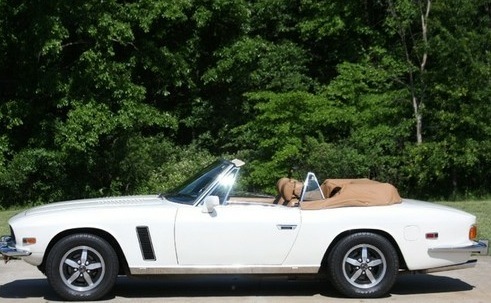 FOR SALE: 1974 JENSEN INTERCEPTOR III CONVERTIBLE at Bramhall Classic Auto. 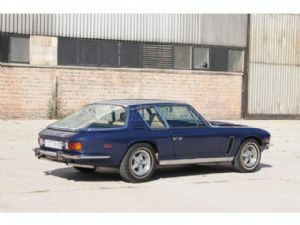 Here’s a listing we found for a Jensen Interceptor for sale.